Spring break tennis camps are available to improve your tennis game and have a blast doing it! We have tennis camps for youth, kids, juniors and adults. 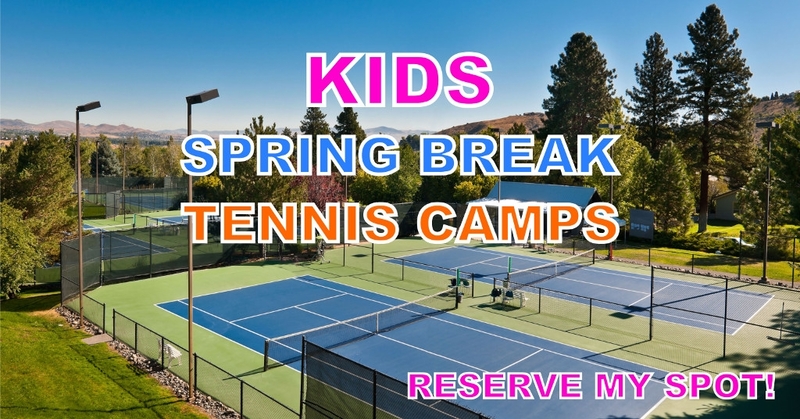 The Spring Break tennis camps and tennis classes are offered to the public and are taught out of the beautiful Caughlin Athletic Club located at 4100 Caughlin Parkway in Reno, Nevada 89519. The tennis club is nested in the Caughlin Ranch community. Tennis Camps and Classes are Available to the Public. Contact us today or call us at 775-240-6505 to enroll. The Junior Tennis Camps are designed to develop skilled junior tennis players and well rounded athletes. The tennis camps focus on the fundamentals of tennis and implementing tennis strategy in a fun environment. Tennis instruction on technique and live-ball play are present in each session. Each student works on their motor skills which include eye-hand coordination, movement, balance and agility drills to help develop the kids into better athletes. The USTA has developed tennis camps designed for kids. It was introduced to help kids take a love for the game at a young age. Our tennis instruction is tailored to kids by keeping each aspect of the class fun and relatable to kids. Kids are able to learn quickly and have fun through the use of smaller courts, properly fitted racquets, and specialized tennis balls.